It's no secret that Qualcomm is going to follow up this year's Snapdragon 835 with an 845 for 2018 flagships - in fact, it's already rumored that Samsung has dibs on the entire first production batch for the Galaxy S9. What is news, however, is that the US semiconductor company will likely announce the Snapdragon 845 at the Snapdragon Technology Summit in December. The event is scheduled for December 4-8 and is to be held in Maui, Hawaii, a leaked invite posted on Weibo reveals. 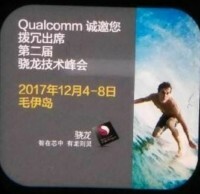 The Snapdragon 835 was made official at CES 2017 in January, so the new model appears to be arriving a month early. 'Arriving' might be an overstatement, though - we won't be seeing the chip in a production device before the spring, as that's when we've come to expect high-end Galaxy S's.